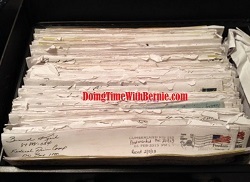 DoingTimeWithBernie.com: Whining felon Bernard Kerik on his prison misery doth protest too much…. 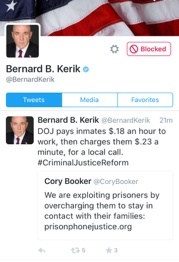 Whining felon Bernard Kerik on his prison misery doth protest too much…. Whining felon Bernard Kerik on his prison misery doth protest too much! As I’ve cited in this blog, Bernard Kerik never had to worry about the cost of phone calls, commissary or any expenses during his incarceration at Cumberland Federal Prison Camp, because he manipulated monetary, services and emotional support from me for the entirety of his imprisonment. (Yes, I have the receipts and prison documentation to prove it, too!) Believe me, Bernard Kerik lived as well or better than any prisoner could live. Inmate #84888-054 never had to worry about one thing, except living with the lies and manipulation he faced upon release. Bernard is busted with his attempting to create an impression to the world he can identify with the average “poor black boy “felon from Washington, Baltimore or “inner city”. Does anyone think any of those felons Bernard Kerik lived with for three years and eleven days lives like he lives now? Stop it. Not fooling anyone. A brilliant attorney recently described Kerik as “libel-proof”. Yup. Conman convicted felon corrupt cop Bernard Kerik lives that label every single day. Why is it allowed to continue? Bernard Kerik, who despite owing $180,000 in criminal restitution to the USA, owns a $2million estate in lily-white Franklin Lakes, New Jersey (next door to faux-reality celebrities like Bravo “Real” Housewife of New Jersey, Caroline Manzo) is a constituent of New Jersey Senator Cory Booker. I’ve never seen Senator Booker, despite being at the same function, share a stage with, mention felon Bernard Kerik or even pose in the same photo-op as corrupt cop and constituent Bernard Kerik! All this, despite Bernie Kerik desperately attempting to make it appear on social media y’all are bosom buds. What say you, Senator Booker?